Leonard Nimoy fought to include "Star Trek" co-stars Nichelle Nichols and George Takei in "Star Trek: The Animated Series." A new exclusive clip from the documentary "For the Love of Spock," which explores the life and legacy of "Star Trek" actor Leonard Nimoy and starts public screenings Sept. 9, shows the famous actor willing to take a hit for his fellow co-stars. "When Leonard learned of that, he said, 'What Star Trek is about is diversity, coming together and working in concert as a team,'" Takei recalled in the documentary. "And, he said, 'The two people who most personify that diversity in our cast are Nichelle Nichols and George Takei. And if they're not going to be a part of this, then I'm not interested.'" The series went forward with the entire original cast (except Walter Koenig's Chekov, reportedly for budgetary reasons) and ended up winning an Emmy. The clip is a lesser-known example of Nimoy's work in the entertainment world. Other work largely unknown to the public include his theater productions in the 1970s, and the large body of TV work Nimoy had before coming to "Star Trek," according to Nimoy's son Adam. "For the Love of Spock," directed by Adam Nimoy, originally was going to focus on the pop-culture impact of Nimoy's role, but expanded to include how the elder Nimoy's life touched his family and friends. An early screening in Los Angeles on Aug. 23 played before both family members and "Star Trek" fans was received with great enthusiasm, Adam Nimoy added. "He was a man of great humility; never blew his own horn," Adam Nimoy said after the screening. But while his dad was reluctant to bring up stories of his career on his own, Adam would ask about it constantly. They would discuss "things that were important, and disappointments and challenges that he faced," Adam said. "I was there through all of it; it was a privilege, and I was honored to do so." While Nimoy was "introverted and somewhat remote," according to his son, the man best known for his Vulcan character agreed with Adam that a documentary about Spock would be a good idea, especially to commemorate the 50th anniversary of the show this month. Unfortunately, Nimoy did not live to see it; he died on Feb. 27, 2015, of complications from chronic obstructive pulmonary disease, which he attributed to smoking. Leonard Nimoy's son Adam visited him on set during the filming of the original "Star Trek." At the "Star Trek: Mission New York" convention, which will be held Sept. 2-4 in New York City, Adam Nimoy will discuss his documentary and the legacy of "Star Trek." For the time being, he is very focused on promoting the documentary and seeing it through its nationwide screening, but Adam said he remains open to other projects commemorating the series. The company 455 Films, which partnered with Adam for the film, is working on a documentary based on "Star Trek: Deep Space Nine." Adam is considering getting involved with that as well as a Mars mission film project with NASA. "There may be some dovetails for 'Star Trek,'" he said. In the meantime, Adam said he remains in awe every time he sees clips from the original series in his documentary up on the big screen. He made the documentary for the fans, he said, and he hopes they will enjoy it. Adam said his dad likely would have enjoyed the film as well. "Knowing him, he would say, I think, that he would be very happy and very pleased," Adam said. He added that his father would have joked, "I wish I had made that!" 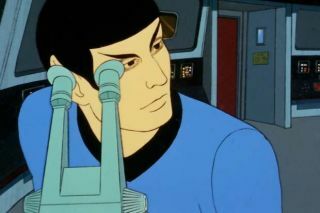 Details about the film screening are available at fortheloveofspock.com. Fans who live outside the cities where the film is being shown can download it on iTunes and Vimeo beginning Sept. 9.